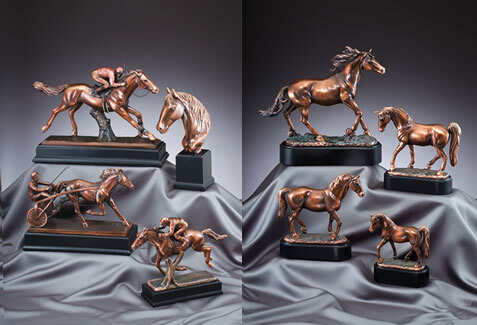 Base 5.75" x 13.5" x 1"
12 1/2" x 10 1/2 Electroplated Gallery Jockey Resin Trophy. 9 1/2 Horse Racing & Jockey Resin Trophy. 10 1/2 Female Horse Resin Trophy. Gameball Trophies Horse Head Resin Trophy. 6 Reward Points Earned. Click Here for Details. Plaque Size 10 1/2" x 13"
Plaque Stand Up 9.25" x 11.625"
#STAR-300 7086 - Approximately 6"
Gameball Trophies Heavy Equestrian Star Wreath Resin. RF-1010 7086 - Approximately 5"
Gameball Trophies Heavy Esquestrian Star Resin. #RF2021SG - Approximately 9 1/2"
Gameball Trophies Male Jumping Horse. Pewter w/Gold Accents Resin Sculpture. Choose From 12 Different Engraving Plate Colors. Up To 3 Lines Of Engraving. 23 Reward Points Earned. Click Here for Details. #RF2026SG - Approximately 9 1/2"
Gameball Trophies Female Jumping Horse. Pewter w/Gold Accents Resin Sculpture. Choose From 12 Different Engraving Plate Colors. Up To 3 Lines Of Engraving. 29 Reward Points Earned. Click Here for Details. Gameball Trophies Show Jumper Horse. Pewter w/Gold Accents Resin Sculpture. Choose From 12 Different Engraving Plate Colors. Up To 3 Lines Of Engraving. 40 Reward Points Earned. Click Here for Details. #RF2091SG - Approximately 8 1/2"
Gameball Trophies Horse Racing. Pewter w/Gold Accents Resin Sculpture. Choose From 12 Different Engraving Plate Colors. Up To 3 Lines Of Engraving. 33 Reward Points Earned. Click Here for Details. Gameball Trophies Dressage Horse. Pewter w/Gold Accents Resin Sculpture. Choose From 12 Different Engraving Plate Colors. Up To 3 Lines Of Engraving. 17 Reward Points Earned. Click Here for Details. Gameball Trophies Pewter Horse w/Gold Accents Resin Sculpture. Choose From 12 Different Engraving Plate Colors. Up To 3 Lines Of Engraving. 27 Reward Points Earned. Click Here for Details. Gameball Trophies Pewter Horse w/Gold Accents Resin Sculpture. Choose From 12 Different Engraving Plate Colors. Up To 3 Lines Of Engraving. 17 Reward Points Earned. Click Here for Details. Gameball Trophies Pewter Harness Racing Sulke w/Gold Accents Resin Sculpture. Choose From 12 Different Engraving Plate Colors. Up To 3 Lines Of Engraving. 30 Reward Points Earned. Click Here for Details. Gameball Trophies Pewter Harness Racing, Sulke w/Gold Accents Resin Sculpture. Choose From 12 Different Engraving Plate Colors. Up To 3 Lines Of Engraving. 46 Reward Points Earned. Click Here for Details. #52712GS - Approximately 5 1/2"
"Lots of Laughs" HE-HA-HA - Bobble Horse's Rear. Choose From 12 Different Engraving Plate Colors. Up To 3 Lines Of Engraving. 8 Reward Points Earned. Click Here for Details. #54745GS - Plaque Size 8" X 8 1/2"
Male Equestrian Heavy Resin Casting Oval. Pewter Finish w/Gold Accents. Gift Boxed & Hand Painted. Hang It On The Wall or Stand It On A Desk/Shelf For Display. Up To 4 Lines Of Engraving. 10 Reward Points Earned. Click Here for Details. #54746GS - Plaque Size 8" X 8 1/2"
Female Equestrian Heavy Resin Casting Oval. Pewter Finish w/Gold Accents. Gift Boxed & Hand Painted. Hang It On The Wall or Stand It On A Desk/Shelf For Display. Up To 4 Lines Of Engraving. 10 Reward Points Earned. Click Here for Details. #50053GS Eq - Approximately 5"
Gameball Trophies Blue Ribbon Resin w/Equestrian Holographic Mylar. Choose From 12 Different Engraving Plate Colors. Up To 4 Lines Of Engraving. 6 Reward Points Earned. Click Here for Details. #R652 Eq - Approximately 6 1/4"
Gameball Trophies Star Resin Figure w/Equestrian Holographic Mylar. Choose From 12 Different Engraving Plate Colors. Up To 3 Lines Of Engraving. 7 Reward Points Earned. Click Here for Details.